June 23, 2018. New York. It was the turn of New York City. Since the year 2016 CCATE has its annual college road trip for the High School students that during the year committed to volunteer helping younger students in the after school program and that committed to accelerate in their education participating in the High School program of CCATE. The CCATE High School group is leaded by CCATE Director of Educational Programs and Research Dr. Holly Link. Dr. Link made contacts, work the schedule, budget the trip, and work with the students questions and things to learn. Dr. Link included also a visit to the Museum of Modern Art, Brooklyn and Central Park. We had a memorable trip that mark the life of our students. On the trip we have also the companionship of parents and mentors, Salvador González, Diana Lugo, and Christy Arango who help the students at every moment and made possible that the trip was safe at all time. 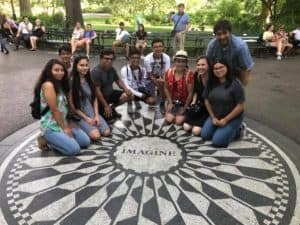 CCATE High School Group at the John Lennon Memorial in Central Park, NY. In 2016 CCATE visited The University of New Haven and Yale University. In 2017 CCATE visited Cornell University and Ithaca College. 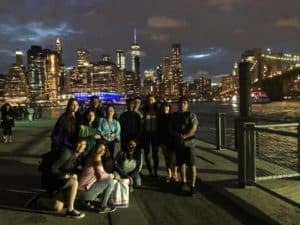 This year CCATE decided to visit the Big Apple, the City of New York and see three different college systems. 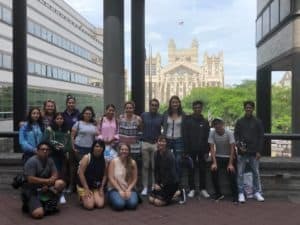 As in previous years we visit and Ivy League Columbia University and a private university New York University (NYU), however this time also we visit one of the most important and largest public college systems in the world as is the City University of New York, (CUNY). CCATE High School Group with Dr. Tatyana Kleyn of CUNY. 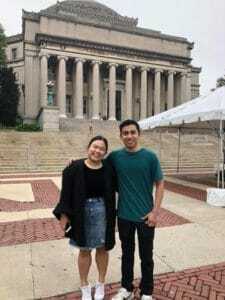 The visit to Columbia University one of the best universities in the world was an inspiring visit because we were received by two young brilliant and amazing students Miguel and Kim, both of them from immigrant families, however their desire to grow and to focus in their studies allow them to make every little opportunity to work. Today they are young leaders, excellent students and an example of the talent in the immigrant community, both of them talk to CCATe students, inspire them and encouraged them to “ponerse las pilas” and work hard in their SAT, to serve the community and to fulfill their dreams. Miguel and Kim. Columbia University, New York. On Friday we visited New York University and we were received there by two master degree students Jasmine and Diana; Diana Stilley who has been instructor and volunteer of CCATE, and last year started her master degree in Latin American and Caribean studies planned the visit with Dr. Holly Link. NYU, is a private university with a creative system that allow the student to design their own majors which attracted CCATE students. 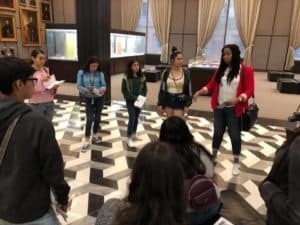 Jasmine talk to CCATE students at the Library of NYU. 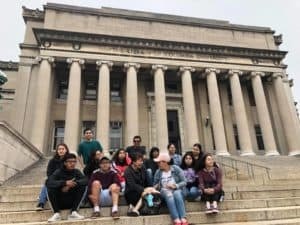 CUNY, one of the largest public universities in the World, CCATE was received by Dr. Tatyana Kleyn who is giving us a personal tour with DACA students. CCATE students felt rapidly identified with them as we share similar stories and situation in our families. CUNY prepared a session, we watch a movie about DACA students called “Still Undocumented” and the Filmmaking class of CCATE also shared “Estudiantes hoy, líderes mañana”. It was a morning of conversation and learning how other Latinx and immigrant students have navigated the system to reach college education and pursue graduate studies. CCATE pursues the formation of young leaders to reach their college dreams and to growth in the love to serve the community. Viva la comunidad!